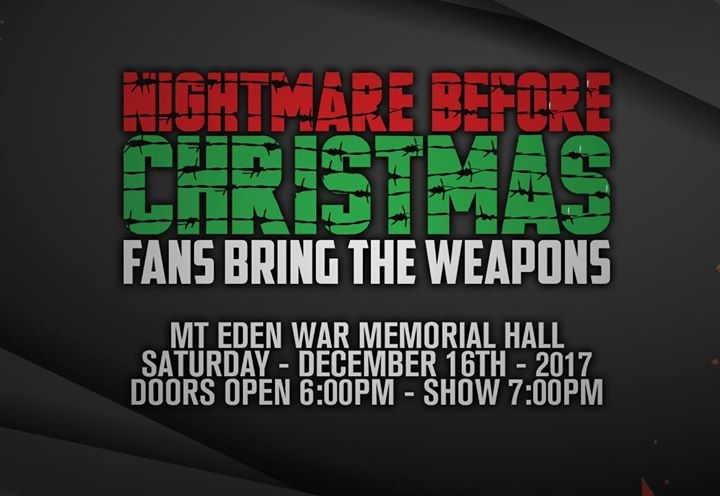 Impact Pro Wrestling New Zealand presents the biggest live event of the year Nightmare Before Christmas 2017 featuring Fans Bring The Weapons! It will be anything but a silent night when the stars of IPW explode on the Mt Eden War Memorial Hall for this three hour spectacular. Fans Bring The Weapons is a match that encourages fans to bring whatever weapon they have at home for the wrestlers to use. From frying pans to Xbox consoles to the kitchen sink, you never know what will end up at the Nightmare Before Christmas. And what the wrestlers will do to each other with those items. An event you need to see live to believe, Nightmare Before Christmas is the pinnacle of the NZ professional wrestling calendar. You don't want to miss this!